Originally introduced in 1984 as the 645. 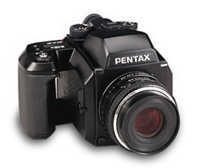 In 1997, Pentax added autofocus along with a selection of AF lenses. Most recently, the 645NII. The 645NII gains mirror-lockup and a few other features as well as some exciting new lenses. 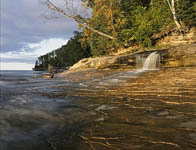 Elliot Creek emptying into Lake Superior within Pictured Rocks National Lakeshore. Shot with the 45-85mm at 45mm. As many of you know, I pretty much used Canon 35mm EOS bodies and lenses. I started to realize that I needed something bigger. After selling most of my main Canon system I chose the 645 SLR format. The reason being is that with the choice of cameras (Contax, Mamiya, Pentax, Bronica), they seemed just as easy to use as my Canon 35mm cameras. Also just as light. So I made the change. My first experience with 645 was with a borrowed Contax 645 system (Thank you Danny Burk). As much as I liked the Contax, I could not afford the tasty Zeiss lenses. I chose the Pentax 645NII because it was the most affordable and also has an excellent reputation. Bronica and Mamiya were never a consideration. The body is well constructed of black textured polycarbonate (plastic). It's lightweight but sturdy, and I usually carry it mounted on my Gitzo tripod with lens attached. It includes a motor drive and normal top-of-the-camera dials. 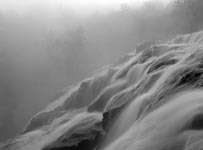 It includes multiple exposure capability by flipping a switch on the left side. On the drive dial surrounding the shutter button can be found the self-timer, single shooing, continuous shooting and mirror-lock-up. Mirror lock-up is also activated automatically if you have the self-timer custom function set to two seconds. Auto bracketing is set with a switch under the exposure compensation dial. The 645NII is very easy to use. Especially the metering system. The camera has a shutter speed dial on the top of the camera with an "A" setting. The lenses aperture ring also has an "A" setting. With both set at "A", the camera operates in autoexposure. With either dial turned off of "A", you get either shutter or aperture priority. You get fully manual when both are off of "A". I find that the Pentax matrix meter is very accurate for almost all situations that I throw at it. Though for the most part I utilize the 1% spot meter. It also has a center-weighted setting that I have not utilized. The Pentax is very good on battery consumption. It uses six AA batteries held in an insert placed in the grip. Lithium and Ni-mh batteries included. Though I mainly use manual focus. I am still using the original batteries. Those were purchased when I got the camera back in May. I finally changed the batteries this January during my Cave Point Sunrise shoot. Vertical?-With most 35mm and 645 cameras, you have to flop your ball head over 90 degrees in order to shoot vertical images. Or buy expensive L-plates (like the $140 RRS plate on my Hasselblad X-pan). Not so with the Pentax. They thoughtfully placed an additional tripod socket on the left side of the camera. When doing verticals, all you do is place the camera on the head vertically. No tipping the camera over and risking losing your center of gravity and increasing the chances for tip over. Pentax has a great selection of lenses. Most now are also internal focus. A neat feature on some AF lenses is a removable piece in the lens hood to allow for easy access to a polarizer (my 150mm 2.8 has this). Also if you find a good deal on a MF A-645 lens, they are compatible. Though the lens focal length is not recorded in the data imprinting. My current selection of lenses includes the 35mm, 120mm macro and 45-85mm. Though Pentax makes lenses from the 33-55mm zoom to the 600mm f/5.6. Compared to Contax, the Pentax lenses are much lighter. This is due to the use of plastic in their construction. Much easier to carry around. A 35mm f/3.5-Equivalent to about a 21mm in 35mm. 77mm filter diameter. The reason I chose the older MF version of this lens is the fact that Pentax increased the filter size to 82mm for the AF version. I really did not want to buy another expensive B+W slim circular polarizer for this lens. This one matches my 45-85mm in filter size. The only drawback I see for this lens is that it only stops down to f/22. Whereas the AF stops down to f/32 for a bit more DOF. FA 45mm f/2.8-Equivalent to about a 27mm in 35mm. 67mm filter diameter. This lens has taken a backseat since the arrival of the 45-85mm zoom. Though I will keep it around for times when I need a bit more speed. I find it useful for shooing aurora borealis where the zoom at f/4.5 would make the shutter speed unusably slow. A 120mm f/4 Macro-Equivalent to about a 72mm in 35mm. 67mm filter diameter. FA 150mm f/2.8-Equivalent to about a 90mm in 35mm. 67mm filter diameter. FA 45-85mm f/4.5-Equivalent to about a 27-51mm zoom in 35mm. 77mm filter diameter. This lens is tack sharp. It is comparable to the above prime lens in this range. It also stops down to F/32. I find it odd that the primes only stop down to F/22. I almost always use the 45-85mm. It is one sizeable chunk. It's zoom convenience outweighs the weight though. I have gotten some accessories for the 645. Those are the AG-80 grid focusing screen. This accessory helps keep horizons level. Screens can be easily changed with the tool supplied with the focusing screen. I also got the Refconverter which does the same thing as my Canon Angle Finder C. It allows 90 degree viewing for low level shots. It also is useful for times when the camera is placed above my head. I also picked up the TS-110 timer remote which can do long exposures and intervals. It is similar to the Canon TC-80N3 timer controller. Though you can still use a $10 threaded cable release which screws into the shutter release button.